Actor, producer, and animal advocate Leo Grillo really wishes people would stop abandoning their pets in the forests and deserts near his Southern California home. While there was a time 35 years ago Grillo thought he could convince people to stop dumping their dogs and cats, he has long known those efforts would prove futile. Veterinarian Dr. Gaylord Brown (left) runs D.E.L.T.A.’s state-of-the-art medical facility; Brown first met Grillo in 1985. With no one to care for them and nowhere to turn, deserted animals often have only one hope to survive — Leo Grillo. Grillo promises every animal he finds that he’ll give them the happy life they each deserve. In 1979, while on a drive through the Angeles National Forest, Grillo saved what would be his first of many animals — a malnourished Labrador Retriever–Doberman Pinscher mix he named Delta. Soon after, while hiking in that very same forest with Delta, Grillo stumbled upon a group of 35 abandoned dogs. That’s how Grillo became the founder and president of his own animal rescue, a rescue he would name after Delta. The Dedication and Everlasting Love to Animals Rescue — D.E.L.T.A. Rescue for short — is Grillo’s 115-acre animal sanctuary in the Glendale hills near Los Angeles. Today, Grillo’s D.E.L.T.A. Rescue has an annual budget of $8 million and 50 employees, including its own veterinary staff and fire department — all to care for the more than 1,500 dogs, cats, and horses who will live out their lives on the sanctuary grounds. D.E.L.T.A. was one of the very first no-kill sanctuaries in the U.S., and it remains one of the most reputable animal welfare organizations today, earning some of the highest marks on the American Institute of Philanthropy’s CharityWatch list. Because of its sheer size and the number of animals in its care, the D.E.L.T.A. Rescue is now the largest animal sanctuary in the U.S. The D.E.L.T.A. Rescue doesn’t take in animals surrendered by the public or transfer in any animals from other rescues — the sanctuary exists purely to care for the unwanted and discarded animals Grillo finds. “I’d rather not be a hero, adopting out our animals and stealing homes away from animals in the pound — wonderful animals who will be killed only because they can’t find new homes,” Grillo explains on the D.E.L.T.A. Rescue website. And in all the years since he founded the sanctuary, Grillo still has a hand in every aspect of the organization. He’s created a winning fundraising strategy, first relying on direct mail and now mastering the art of getting online donations. What the sanctuary needs, Grillo buys or makes himself. Grillo even designs and builds housing for the dogs at the D.E.L.T.A. Super Sanctuary with his own two hands; using 25 bales of rice straw, three sheets of plywood, wood supports, and a stucco exterior, Grillo constructs shelters sturdy enough to last for the entire life of a dog — sometimes longer. There is no length to which Grillo will not go if it means saving an animal’s life. Veterinarian Dr. Gaylord Brown remembers meeting Grillo in 1985, when the actor brought him a dog who’d been hit by a car. Though the cost of treating the dog’s severe injuries was astronomical, Grillo urged Dr. Brown to do everything he needed to do in order to save the poor dog. Dr. Brown is now D.E.L.T.A. 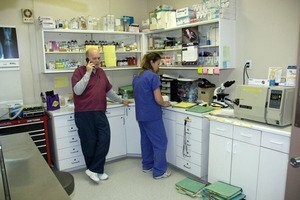 Rescue’s veterinarian, leading an experienced team at the sanctuary’s state-of-the-art pet hospital, a hospital Dr. Brown helped Grillo build from the ground up. D.E.L.T.A.’s veterinarian spends most of his time caring for the sanctuary’s aging or ill pets, treating or managing conditions like cancer, arthritis, and a number of heart, kidney, and liver diseases. While the sanctuary is considered no-kill, Dr. Brown explains he and Grillo are never comfortable letting one of their animals languish in pain. If you would like to learn more about the D.E.L.T.A. Rescue sanctuary or to make a donation to the animals in Leo Grillo’s care, visit the organization’s website or Facebook page today.